Successful cyclists have one thing in common: Basic cycling training principles. Some riders rely on long slow distance training and others believe in high intensity training. But they all use some core principles that are fundamental. If you’re a beginner you’re probably wondering: What’s the secret? In this article, I’ll guide you through some the most used training methods to achieve better results with your cycling training. One of the best ways to improve fast as a beginner cyclist is to get structure into your cycling. I have often been told by my riders that they feel much stronger when they’ve started on one of my cycling training programs. In the beginning they believe that it is because of the special combination of intervals, but I keep telling them that the single best explanation for their progress is that they now have a structure on their training program. 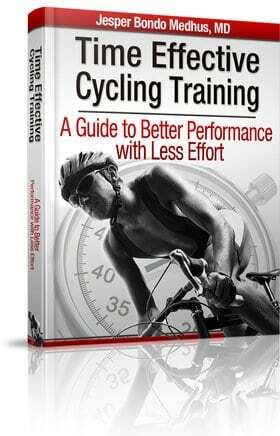 If you are a hard working cyclist, you deserve to achieve good results with the work you do. You don’t (necessarily) have to train more or harder to achieve better results. If you get the right structure with proper amounts of interval training on the right days, there is a good chance that you will improve fast and continue doing so. And yes, I certainly believe interval training should be in every training program – also when planning cycling training for beginners. I like the idea of being smarter – not training harder. I know it is a cliche but there is definitively some truth waiting for you in this slogan. If you want to learn more about my training philosophy, please make sure to subscribe to email updates below. When you’ve performed a hard training ride, your body will have to recover before it get’s stronger. How much time you need for recovery depends on the type of training, your overall fitness and nutritional status. There are also some other factors that influence on your recovery time, but for a beginning it is important to know that hard training takes more time to recover from than light training. When you have trained for a while you will start to experience that your legs might feel sore the day after a hard interval workout and feel fresh the day after a light training session. Thus, you are about to get the idea about super compensation. To get the best progress you will need to find the perfect combination of training sessions and recovery. There are mainly three ways to change the total workload in a training week: Frequency, intensity and duration. E.g. if you train more frequent, ride with a higher intensity (more races, more intervals) or simply just ride more, you will force your body to adapt to these challenges. This way you can reach a higher level of fitness, but your body will not allow you to increase the total workload too fast. Good cyclists make use these buttons to turn up and down the workload all the time. Remember that it is the consistency that makes you a strong cyclist, not just one hard week of biking. Small adjustments over time will help you to become a better cyclist. The most popular method of improving your threshold power is via interval training. It is crucial to know your power output and/or heart rate at threshold power and use these values to pace yourself throughout intervals at the same intensity. You will have to do a performance test or a time trial as a reference. The trickiest part of doing intervals is to remain at the right intensity throughout. Going a bit too fast at the start makes it impossible to maintain the right intensity to the end. If you go too slowly, you will not get the improvements you are training for. Interval sessions are one of the main parts of any training schedule. But if you see them written down, it can sometimes be difficult to understand what they are and how to do them. Some riders are put off by this and left baffled by explanations that resemble complex mathematical formulas. To the uninitiated, this may look confusing and meaningless, especially if you were to read it in a book or on the internet, so let me explain. In this example, threshold power refers to an intensity you should try to maintain throughout each interval. Although you are unlikely to know what your actual threshold power is, when you have tried these intervals a few times it will become much easier to pace yourself correctly. For the recovery periods it is advisable to do some light pedalling to remove metabolites and keeping your oxygen consumption at a moderate level. This will then make it easier for you to perform the next interval at the right intensity (and get more time at the right oxygen consumption. If you don’t pedal in the recovery periods then the beginning of the next interval will actually become more anaerobic. Intervals are normally performed at sub-threshold, threshold and VO2 max training intensity as described below. Before you begin with the interval training it is a good idea to perform two tests to get a better picture of your current fitness. These tests help you to get a better pace during intervals and makes it easier (and more motivating) to track your progress. 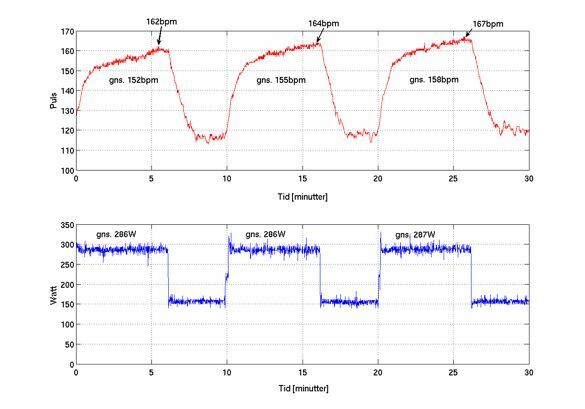 If you use heart rate monitor as your main pacing tool then your average heart rate during the last 20 minutes of the 30-minute test is an excellent indicator of your threshold heart rate. 2. Every 2 min, increase workload ~35-50Watts depending on fitness level. 3. Ride until exhaustion. Notice your maximum heart rate. Heart rate: Below 65% of maximum heart rate. Power: Below 55% of threshold power. This is the easiest training intensity and should reflect that you want to train without conflicting with the recovery process from previous intensive training sessions. Correctly made recovery rides may actually provide a small boost to your overall recovery. Heart rate: 65–80% of maximum heart rate. Power: 55-80% of threshold power. This is your main training intensity. Sometimes you are able to push it a little harder but you should always be able to maintain this intensity throughout the training session. Heart rate: 80–87% of maximum heart rate. Power: 80-90% of threshold power. This training intensity is just slightly below your threshold power and is a secure way to improve your aerobic engine. Heart rate: 87-92% of maximum heart rate. Power: 90-105% of threshold power. This training intensity is close to your threshold power and gives a boost to your aerobic engine. Heart rate: 92-100% of maximum heart rate. Power: 90-105% of VO2 max power (five-minute maximum test). This training intensity is close to your VO2 max power and is the most time effective training for VO2 max gains. Heart rate: Not useful for pacing. Power: 90-102% of maximum power corresponding to the duration of the interval you train. For example, if you plan an anaerobic interval of 30 seconds, then you should base your power output on your power output in an all-out 30-second sprint. So your target power should be in the range of 90-102% of your power output in an all-out 30-second sprint. Please note that the above mentioned intensities are only general guidelines and should be read as such. As you get used to these different training levels, you might begin to make more training zones, e.g. low-end Threshold power, high end sub-threshold etc. If you feel you are able to maintain a higher intensity than the intervals prescribed, there is only one way to find out. If you are unable to maintain intensity, you may need to analyze whether there is a good reason for this. Have you fully recovered from your last training session? Are you slightly dehydrated? If you feel well but have a general problem performing the prescribed intensities, re-adjust the intensity levels mentioned in this article to fit your own unique physiology. What is the right training philosophy? Many coaches develop training sessions targeted to improve your threshold power. Intervals with an intensity around your threshold power are the most common and they are very time effective, too. Other coaches believe in intervals slightly below threshold power – sometimes referred as ‘sweet spot training’. As you can see there are many ways to train which will boost your aerobic engine. I agree that threshold power is often the single most important parameter for endurance athletes. Though, it is important to remember that most cycling races are not won at an intensity around threshold power. So don’t forget to train your anaerobic endurance, sprint skills and VO2 max as well. These skills are all required when to race goes on. Performing all your training at an intensity below threshold power is simply not sufficient to build a superior VO2 max / anaerobic endurance / sprint skills. Interval training is the most effective way to add quality to your training sessions. Not only will structured intervals help you to start training with higher intensity, but it is also a safe way to get a controlled amount of high intensity training. Thus, it is possible to make continued progress in the intensity and number of intervals, as you get stronger. I tend to recommend three days per week with intervals and/or race activity. Three days per week seems like the perfect balance between hard days and recovery. Though, it is worth noting that you can make successful variants with more or less interval sessions that may work as well or better for you. If you reduce the amount of intervals in each training session, you can add more training sessions per week. Again, it’s a balance, and it is most important to find a system that works for you, and helps you to achieve the best possible long-term results. When you increase the total interval training workload, there is always a risk of adding too much work too quickly, which causes symptoms of overreaching. I believe sub-threshold intervals represent the safest training intensity to add to your training structure without risking a burnout. If you normally train 3 intervals of 10 minutes, try to make 3 intervals of 12 minutes or 4 intervals of 10 minutes, or you can use any combination and simply just keep an eye of the total time (as long as you train at sub-threshold intensity). If you want to increase the amount of high intensity intervals (threshold power intervals, VO2 max intervals, or anaerobic intervals), you should make smaller increments and watch your reaction carefully. It is no secret that a heavier workload requires more recovery. If you increase the workload too fast, you risk not being able to recover enough before your next training session. That could cause a negative spiral in your performance instead of the opposite. Are you ready to act? If you don’t act – nothing happens. Guaranteed. As soon as you realize that it is you who are responsible for your own results then you will start to move. I won’t push your pedals. Thank you, is an excelent articol, very usefull, pointing very clear directions to follow. I am eyes and ears on it. I have one simple question though: are the defined heart rates calculated using the Karvonen method? @Ciotic – Thank you. I’ll try to make a couple more of these longer posts. @Kristian – Heart rate zones in this article are calculated as percentage of maximum heart rate. From a practical point of view, I believe, it is just as fine as the Karvonen formula. And it is much easier to communicate and understand for most people. Though, I agree, that from a theoretically point of view Karvonen has a point. Still, both methods need a personal fine tuning to work optimally. 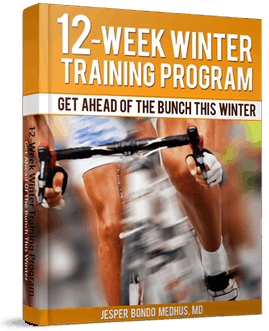 I downloaded your 12 Week Winter Training book and enjoyed it very much. You recommend using sub-threshold training which I believe is also known as Tempo in some books. My current training incorporates one hour continuous sub-threshold workouts. Would there be an advantage to breaking it up into sets? As you can see, there are three sub-threshold intervals on most Saturdays. The recovery between these intervals is not set in stone but take the time you need to feel sure you can maintain the planned intensity in the following interval. Since it is a sub-threshold interval, it is also be possible to do one long 45-minute interval to get the interval training done. It might seem impossible but it isn’t. Actually, it would probably provide a great training boost. Though, most riders would appreciate at least five to 10 minutes between each interval of 15-20minutes. I guess you will feel it is easier to get your training done if you split the sub-threshold intervals up in e.g. 3 x20min. Great article. I am amazed with all the riders out there how good advice is hard to find. Hi back there? Iam new for cycling sport and only graduate sport science. u know wat I know. that is the science of sport, …. but specifically I became National cycle federation technical director. Now I want to prepare “MANUAL” for youth project age of >13, >16 and >18. would u mind to help me. Hi Mr Jesper i am Vernon from Port Elizabeth South Africa thanks for being so nice to those cyclist you do not know but once again it shows the passion for the sport is rooted inside of you .Thanks to you . I’m new to cycling and my goal is to ride distances and eventually a century ride. I’m doing about 25-40 miles every other day and am looking to do things that make me better. Guess I’m just not that bright but this is way too complicated for me. The terminology just goes right over my head. Thanks for this article. This is exactly what I am working on during my winter training sessions. Your explanations have cleared up a couple areas of confusion for me. I am on week 5 of your winter training program and I’m seeing very positive results. I’ve been receiving your emails for about a month now and by far your VO2 max Booster Program seems to be to most comprehensive and suited to my needs. I will carefully follow your instructions and provide you feedback. Please answer on question. I need to be sure about your recommonded efforts. For example 3x (5+3min) 80 / 50% VO2 Max. Please explain the latter part of this 80 / 50% VO2 Max. I also am a physician (Anesthesiologist) and in my first year of competitive cycling. Coming from a bodybuilding background, I had no idea how to train for an endurance sport. I was also cautious of just blindly following how others train because “that is how we were taught”. So, I did an medical literature search at our Medical University after reading the info you’ve generously provided on your website. The core principle of training to VO2 max is ALL OVER the medical literature and validated as the fastest training technique. In fact, there are plenty of articles in The Journal of Applied Physiology that have a VO2 max programs following similar training formats for ten weeks with powerful results that were linear in growth. One of the articles comments that their subjects had faster gains than professional teams who spent many more hours training. So, my fifteen year year old son and myself (46 y/o) started your 14 day VO2 max program. It actually took us about a month to complete due to forced days off because of fatigue, as determined by over 10% drops in our power output. At the end of the month we repeated a VO2 max power test with a 20% increase! We are now completing your 12 week winter training program to be ready by summer. Thank you for your hard work and sharing your training results online. Thank you for this service to us cyclists. Though entertaining, patient and informative to those who understand the terminology used in this article. I would make a friendly suggestion that this is anything but training for beginners. We beginners do not know what VO2 max is (i get that it STANDS for volume of oxygen but i dont have any idea why that is important) nor what most of the terminology you use means. I would offer that explaining to us beginners what an anaerobic engine (and the rest of the terms ) is and why it is important and what it is best used for would be more beneficial. Hi, Dr. Jesper ! You have a very educational approach. Do you have contacts of certified cycling trainors/instructors? Thanks and more power. While performing the 5 -minutes test, should you keep your heart rate at a constant level, or is it ok when your hear rate increases towards the end of the test? Hi Coach….I have been following the 12 week program and gleaning info for nutrition and hydration. I commence the epic ride of my lifetime on june 6th….Vancouver to Newfoundland. ..2700k..72days..thanks to u I feel I will be ready…Cheers Sid!! A great article that I discovered between my road and MTB season. The clear description of what certain workouts effect is very helpful. I’ll be using the workouts throughout my 2015 MTB season. Just stumbled upon your page and it gives very good tips! Thank you! Just have to say this post is absolutely amazing for anybody trying to improve their cycling performance. I haven’t bought your program yet but I’ve always struggled with getting the exact pace/intensity for my interval training, so I might give it a look in soon! Once again, thanks for such a great post on a topic I’m sure all cyclists will be intersted about! Hi, Dr. Jesper ! Thanks for the tips! Great post Jesper, and I agree there’s too much focus on threshold from a training perspective. I think the difficulty a lot of athletes have is thinking that to train threshold, you’re best to always train at FTP, not grasping that FTP development comes from below and above, as well as AT threshold. The right balance between all three is what’s really key, and because training below it seems too easy (especially for the time-crunched cyclists) they deem it “junk” miles, which couldn’t be further from the truth! I think for the cyclist willing to do a bit of research, Strava is excellent for seeing what top performers are actually doing day-to-day, and this can then trickle down and inform the practices of more everyday riders.